Welcome back to another Ketchikan Fishing Minute. With most of our videos, we showcase the salmon fishing available in the area. Ketchikan is known as the Salmon Capital of the World, after all. While there are still plenty of kings in the area, it is a bit early for silvers and pinks, though some are showing up on the dock already. 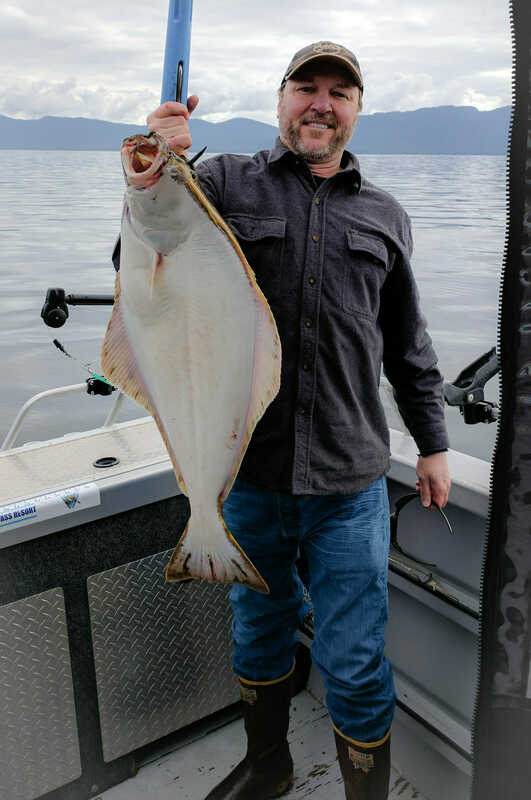 Halibut and a large variety of rock fish are available in the waters around Ketchikan, and Oscar and I were joined by Clover Pass Resort General Manager Bret Raby last Saturday as we went hunting for bottom fish. The weather was spectacular, with temperatures in the 60’s and plenty of sunshine. We took one of the Clover Pass Resort Yellow Boats out to a spot off the coast of Prince of Wales Island, fishing at a depth of about 250 feet. Oscar and I were primarily using circle hooks while Bret had on a lead head J-hook and a large rubber grub. I pulled in a nice little halibut within the first half hour or so. After that, everything seemed to avoid my line. Bret was the big winner of the day, as he pulled in two halibut, a yellow eye rock fish, and a big lingcod. Oscar also did well with one halibut and decent sized quill back rock fish. Toward the end of the day, it seemed like we were missing a few strikes, but finally Oscar landed what he hoped would be a decent size halibut. It turned out there were sharks in the area, which probably spooked most of the fish around. After Oscar pulled in his shark, we pulled up our lines and headed back to the lodge. But we will be at it again next week for another Ketchikan Fishing Minute.